Firstly, this review was performed to assess the effect of breastfeeding on infections during infancy in industrialized countries. Secondly, the effect of duration and exclusiveness of breastfeeding were explored. Studies were identified using Medline, Cochrane Library, Science Citation Index and by a manual search from bibliographies of articles from August 1986 to January 2008. Follow-up, case–control and randomized controlled trial (RCT) studies performed in an industrialized country, published in English, with breastfeeding as a determinant, with overall infections, gastrointestinal or respiratory tract infections as a major outcome, and at least 40 participants in the study were included. Using Bauchner’s criteria published in a review in 1986, two reviewers and a peer reviewer assessed the internal validity of those studies. Twenty-one studies that met the inclusion and internal validity criteria were included. These included 16 follow-up and four case–control studies and one RCT. Four out of five studies observed decreased effects on overall infections in breastfed infants. With regard to gastrointestinal infections, six out of eight studies suggested that breastfeeding had a protective effect. Thirteen out of 16 studies concluded that breastfeeding protects infants against respiratory tract infections. Five studies combined duration and exclusiveness of breastfeeding. All studies observed a protective dose/duration-response effect on gastrointestinal or respiratory tract infections. These studies strongly suggest that breastfeeding protects infants against overall infections, gastrointestinal and respiratory tract infections in industrialized countries. The optimal duration of exclusive breastfeeding for protection against infectious diseases needs to be studied in more detail. Duration of lactation and incidence of myocardial infarction in middle to late... 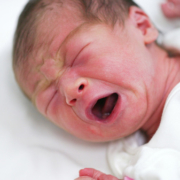 Does Breastfeeding Reduce the Risk of Sudden Infant Death Syndrome?